The Adventist Home is a compilation of Ellen White statements on the subject. Like all compilations, it has readability issues. After all, it was not written as a book. There may also be context issues, and sometimes it may be wise to read the whole statement from which only an excerpt was published. But all in all, this book is a good reference point for evaluating any other advice on how to have a Christ-centered home. It has practical advice on most aspects of living in an Adventist home. If you’ve never read this, we suggest you start here. Child Guidance is another Ellen White compilation. It is on the subject of raising children to love the Lord in an Adventist home. Again, the principles and practical tips are invaluable in a world awash with contradictory counsel. We’ve used these books as our filter through which we view all other advice. In the Family Faith Devotional, Claudio Consuegra and Pamela Consuegra share gemlike truths that families will be able to apply to living life in today’s crazy, busy, and sometimes overwhelming world. Everything we need to know about how to raise strong, resilient families can be found in the Bible. Through the stories of these ordinary people who, just like us, faced challenges and triumphs, tears and laughter, exuberance and exhaustion, we can learn how to honor God in our homes. Did you know that you can return any Amazon Kindle book if you buy it, start to read it and find it’s not what you wanted? It’s easy. Just go to “Content and Devices” on the Amazon site and click on a box in front of the title of the book. Choose “Return for Refund” and state a reason or “other” within a reasonable time after purchase. I don’t know how long it will work, but it has worked after 3 days for me. Just don’t do it too often, or Amazon may ban you from buying from them. In The 7 Habits of Highly Effective Families: Building a Beautiful Family, Steven Covey, author of best-selling The 7 Habits of Highly Effective People: Powerful Lessons in Personal Change applies the same principles to “building a beautiful family.” Being a Mormon, Covey’s biblical values come through enough to annoy some people. Sabbath Action Blast, by Guide magazine editors Violet Nesdoly and Kim Kasch. Lots of antidotes for the Sabbath “I’m bored” complaint. In these pages are 101 of the best Sabbath activity ideas that Guide editors have ever seen—nearly two years’ worth of fun! Some of these activities are great for groups, while others are perfect for solo ventures. And whether you plan ahead or flip through on the spur of the moment, you’re sure to find something to make you smile, laugh, have fun, and learn about God! Sabbath Nature Activities by Eileen Lantry is an old favorite now available in Kindle format. If young children and teens are to learn to love the Sabbath, parents need to actively plan Sabbath activities to suit the interests of their children so that Sabbath is not the “most boring day of the week.” Parents will find help in this book to plan fun and interesting Sabbath activities. 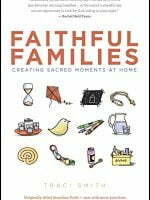 Faithful Families: Creating Sacred Moments at Home, by Traci Smith. Add family faith moments to your daily routine with little or no prep and share meaningful spiritual experiences with your children! Traci Smith, a pastor and mother of three, offers fresh ways to discover and develop new spiritual practices as a family, whether you’re a new seeker or a lifelong follower. Brimming with more than 50 easy, do-it-yourself ideas, Faithful Families will transform your family’s everyday moments into sacred moments! Adventist Family Traditions, an Adventist classic by Celeste perrino Walker provides more ideas for building family traditions specific to Adventism to bind families together. Family Sabbath Traditions: Filling the Sabbath Hours With Joy (Adventist Family Traditions) by John and Millie Youngberg is only available used and in paperback at Amazon. (Lots of copies available if you click on “Other Sellers.”) And if you can’t find it there, you may find some copies with and African-American cover at AbeBooks.com. Help make Sabbath the favorite day in your family by putting some of these suggestions into practice! Another Adventist classic, Sometimes I Don’t Like My Kids, is written by Candace Schap, who confesses, “I am not what is commonly called a ‘natural-born mother.’ I went through a long period of time in which I had very negative feelings about my children and the whole experience of motherhood.” She provides an honest look at the frustrations of mothering and the dangers of the “supermom” syndrome. From her own experience as a mother of four, Candace shares down-to-earth suggestions for identifying and dealing with the anger you face in mothering, conquering a mountain of housework, handling depression and disappointment, and dropping the “supermom” façade. This is a manual of recovery—the recovery of joy in the Lord and in your family. Barbara Coloroso doesn’t write from a specifically Christian perspective, but her focus on instilling self-discipline is quite in line with biblical principles. The doesn’t believe in spanking or “grounding,” but she does believe in “parenting with backbone.” Many parents have found her methods effective, and it is likely that even if you believe in not sparing the rod, you will gain from using her methods of instilling self-discipline in Kids are Worth It. After all, self-discipline should be the goal of all external discipline. If you can identify with “triggers” and the cover photo, you will likely gain some practical insights in this book. Triggers: Exchanging Parent’s Angry Reactions for Gentle Biblical Responses examines common parenting issues that cause us to explode inappropriately at our children. Moving beyond simple parenting tips on how to change your child’s behavior, authors Amber Lia and Wendy Speake offer biblical insight and practical tools to equip and encourage you on the journey away from anger-filled reactions toward gentle, biblical responses. This book by by Kay Wills Wyma and Michael Gurian reminded me of what one of my friends did when her oldest was 14, when she realized that she was not in control; her kids were. Her kids now speak in awe of that time. So, yes, a child’s character is largely formed by the age of three, but don’t despair. You can still make a big difference later in life. One of the Amazon reviewers provided this synopsis: ” Kay, mother of 5 kids, came to realize that her kids were spoiled and had a sense of entitlement, and worse, that she was their enabler! So she birthed a one-year experiment in which each month she would add a skill or focus for them to build on, in hopes of building independent, self-sufficient, and unselfish kids. The resulting book, Cleaning House: A Mom’s 12-Month Experiment to Rid Her Home of Youth Entitlement, will make you laugh while challenging and inspiring you.” Be aware that this is written by a Dallas, TX, stay-at-home mom with the financial resources to have help come in twice a week. She’s not the most disciplined soul herself, but she still made a difference in her children’s lives. And another one on a similar topic is When Kids Call the Shots: How to Seize Control from Your Darling Bully — and Enjoy Being a Parent Again, by Sean Grover. Remember that God wants parents to be in control – to “command” their children after them. Abraham is commended for doing that. So while the Bible should be our foundation for discipline, practical tips can be picked up in lots of places. So check this one out. Setting Limits With Your Strong-Willed Child, by Robert J. Mackenzie, an educational psychologist and family therapist, shows parents how to set limits according to old-fashioned values. Check out the editorial review on Amazon (scroll down the page) to see if it meets your needs. The Sabbath School lessons for the second quarter of 2019 were on Family Seasons. You may download the full lesson quarterly for studying Family Seasons from Amazon in Kindle format. Lesson authors Claudio Consuegra (Author), Pamela Consuegra also wrote the companion book on the same topic, Family Seasons, in the Bible Bookshelf series, which is available in Kindle format. Ellen White Notes for Family Seasons, second quarter of 2019, Pacific Press version. The “official” version of Ellen White comments on. Sabbath School Lesson Comments by Ellen White on Family Seasons, edited by J. L. Malmede VanAllen. Each 96-page eBook contains one full page of reading for each day – no fillers or advertising, additional references for further study, and much more. Please comment below on any books you have read and suggest any other books you have found helpful.